"Al McKee of Benjamin has discovered a natural substance that soaks up oil. Haillburton Co., has contacted him and the EPA has pushed the flour-like substance through all the regulations to help soak up the oil in the Gulf. 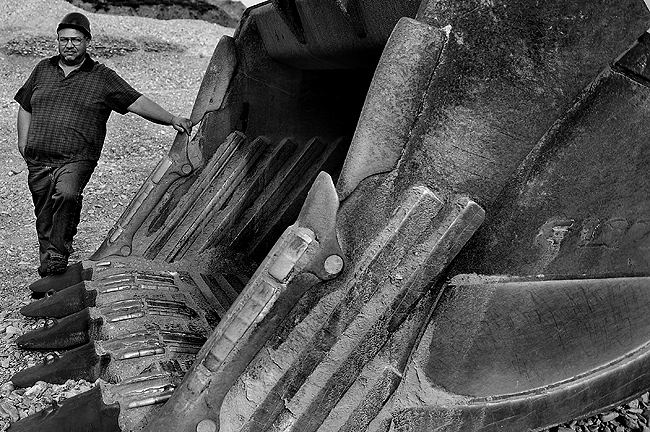 He poses at one of his mines, Thursday, May 27, 2010." I edited this photo with a crop from last month. My editor told me I was headed to a mine for a story revolving around the oil in the gulf. From the article, Provo's Ophir Minerals & Aggregate Group for some time has extracted a mineral it calls "K'sorb" out of its Payson mine. The mineral itself -- calcium carbonate -- is not unique to Utah, but the crystalline structure of the local stuff is unique, and allows the all-natural, flour-like material to soak up eight to 10 times its own weight in oil. I met Al McKee at his home where he demonstrated this fascinating process of sinking oil that's on the surface of water. He then took me to where they mine it for a photo op and tour. Little did I know, a mine is not always something underground or in the side of a mountain. I was under the assumption I'd be going down a dark, scary mineshaft for photos. We shot a variety of stuff while at the mine. Despite his great personality, I couldn't get McKee by himself. He insisted having his son in all the photos. So when I was archiving tonight I made a tight crop of the image. I don't know why I like it. Probably the old, timeless feel. And the tone is fabulous! Nicely done.